Man's beads (from old-rus. ch't - to consider, read, honour) is a cord or ribbon, more frequent than all reserved in a ring or being a thumbs-under cord, which knots are stuck on, beads (grains, stone, beads) are beaded , plates or other relatively homogeneous elements. 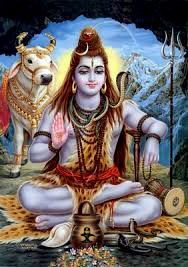 In all of religions (hinduism, islam, christianity and buddhism) used for the account of the read prayers or other sacral actions, maintainance of attention and concentration, tasks of rhythm et cetera. In modern medicine (litotherapy) is a medical gymnastics, physical education, charging for the racemes of hands, development of adroitness of hands, training and rehabilitation after traumas. Construction and form beads, number of elements, material, color, method of carrying and use provided with in different studies different symbolic senses. Often a rosary contact with a recurrence and endlessness, with connection and succession, with a chaplet (by a crown), stair in sky. "Man's beads" (rus. "rosary"), kombologion, chaplet, subha, comboloio, bead - practically the Russian word, possibly, is from Middle Asia and Kirghizia (conversations of Chingiz-khan, Fergana, Khaydarkan is the CIS). It is formed from a word "ch't'ka" ("beads" are "directives", "ch'sti" - to "consider", "take" into account). Encyclopaedic comment: marbles and beads of comfortable (by ergonomics) form for a rosary are made out of stone, bone (bull), tree, amber and other suitable for these aims of durable, not fighting and beautiful material. It can also be the chainlet special form, look like beads. At Orthodox Church (orthodox christians, Zagorsk, Moscow region, Russia, CIS) and catholics (Vatican in Italy - the European city which is located on territory of modern Italy is inferior Spanish Crown, way "From Varangian in Greeks") to the rosary an icon (image of saint) or cross is sometimes suspended. In an orthodox church a rosary with appearances (images of saints are in a church stilizovannom kind) is often used by monks and nuns. 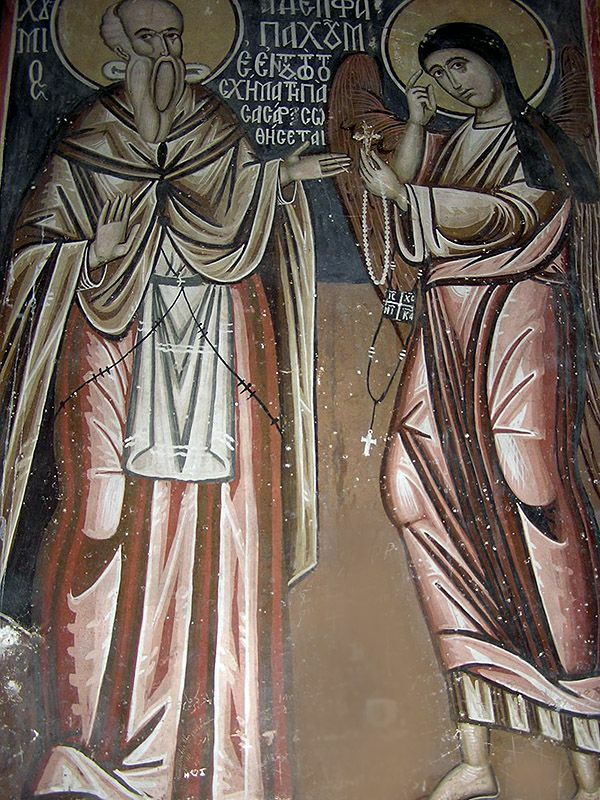 St. Pachomius the Great (St. Pachomius of Egypt, birth from Thebes, Egypt) is added introduction to christian practice of consuetude to use a rosary. Appeared first beads in Russia in IV in. and entered in everyday life the founder of one of the first christian monasteries of Pachomius Great (347 died, on May, 9). Founded a monastery which gave strict monasterial regulation. In Russia a rosary was widely entered in everyday life in XIV in. 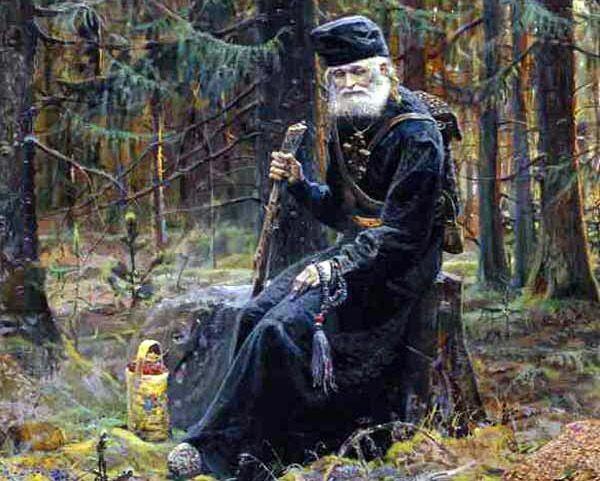 by the founder of one of the first christian monasteries Father Superior of a monastery St. Sergius of Radonezh, "Great Hermit" (1315-1392 A.D., the Holy Trinity-St. Sergius Lavrae, Zagorsk, Moscow region, central European part of Russia, CIS) for competent and scientific monks (in Russia at monasteries until now teach a modern deed, to read and write - librarys) which must accomplish the certain number of prayers and bows daily. Blessed on a battle Dmitry Don. Man's beads is widely widespread adaptation and trainer for the medical gymnastics of hands and treatment of racemes of hands (rehabilitations after wounds and battles), for counting out of the read prayers (on a lake is Rostov Great, Kremlin, "Gold Ring of Russia", CIS), perfect bows (Ivan "Grozniy" IV Threatening, Moscow, Kremlin, Russia, CIS) and similar religious actions, and also for moslems as a durable lace with knots or beaded on him 99+1 beads or with 99+1 knots and part on three equal parts (the amount of beads and knots corresponds the number of "wonderful matters of Allah"). Also hemp or other lace with knots (large knots, Russia, CIS Pereslavl-Zalesskiy, are a "knot letter") or beads (East tradition is China, nephrite rosary, "Great Chinese Silk Way - the Milky Way, via lactea"), office worker for the account of the read prayers (prayer) of beads; kombologion; (in Western christianity, especially for the catholics of Vatican and Spain) rosary; (a variant is beads for catholics, consisting of 55 (sometimes from 59) grains of chaplet; for the moslems of subha; for moslems with 99+1 beads comboloio grain (beads) - bead to read prayer on a rosary - to count (say, tell, bid) one's beads. A rosary is widely widespread also for buddhists and moslems (tradition came easterly, China, where a "tsar of stone" is a green not poisonous and not radio-active nephrite). Moslems also use for a rosary a quartz-hairstone (mountain crystal and quartz with a jetstone by a schorl) is a "beard of prophet of Mahomet" - if the mountain will not come to Mahomet, Mahomet must go to the mountain, is a stone rosary. Initially clear for islam men in hands could be a womanish stone jewelry - "namisto" and beads on the neck of wife or bangle on its wrist. A rosary usually is the sign of the married men is religion islam. In christianity a rosary appear not later than IV century. It is considered that the initial form of rosary was a rope with the stuck knots - so-called "vervica". Different personalities, entering a rosary for counting out of prayers in christian practice, are specified in different sources. The sainted is more frequent than all named Pachomius. Man's beads in a monkhood named "By a spiritual sword" and handed a monk at making a nun. A rosary is the attribute of archangel of Salathiel. There can be a different amount of beads in an orthodox rosary, but a rosary is more frequent than all used with 33 beads, on the number of earthly years of life of Khrista, or multiple 10 and 12 by a number. In a 87 rule of Nomokanone of XI century talked about vervice (rope rosary), having 103 knots (a number is an amount of small knot alike on 108). In the Balkan orthodox countries on a border with the CIS the special sort of stockings rosary is used - "broyanica". In church practice of the Russian Orthodox church attitude toward the use beads out of church careful - it is considered that a rosary is obligatory exceptionally to the monks. In Old Belief to use in practice "lestovka" - beads as a ribbon with 109 "bobochka" ("by the stages"), part on unequal groups, symbolic means a stairway from earth in heaven. A catholic rosary (Man's beads, rosarium) sometimes consist of 50 grains, part on five ten-day periods and used for prayer. Also a rosary can be used from 33 and by 150 grains. Rosarium symbolic means the "crown of faith" from a blackthorn (dlikaya plum), wild rose (wild rose), wild roses and chaparral (martyrdom). The monks of catholic franciscan order used seventen-day rosarium (7 elements) in memory about "seven gladnesses" of Virgin Maria (the Blessed Virgin, Mater Dolorosa - "Maris Stella"), named "franciscan halo", "seraphic rosarium" or "rosarium of seven gladnesses of Blessed Virgin Maria". For basques the use of rosarium is traditional as a ring, put on during prayer on a finger (finger digit) and consisting of cross and ten grains. not having analogues form of rosary of hand-worked allows to get an effect "su-dzhok" therapy and to execute the massage of active human points of body fingers and palm in the process of meditation. There are not acute engles. For the certificate. Christianity - one of three world religions, plugging in itself three basic directions: orthodoxy, catholicism and Protestant, each of which is subdivided into the row of more shallow religions and religious organizations. Christianity a faith is underlaid in triune God (Blessed Trinity): Father, Son and Sainted Spirit, asserting, that a man Jesus Khristos is embodiment of the second posing of Blessed Trinity ("Svyataya Troitsa" in rus.) as a god-and-man, getting off on earth and accepting sufferings and death, rosening and uplifted on skies. Православие - one of three main and eldest directions in christianity, along with a catholicism and Protestant, folded in Byzantium, presently being the most widespread religion of Russia (CIS). Finally keep aloof in XXI century in connection with the division of churches. Orthodoxy arose up as an east branch of christianity after a division in 395 To the Roman empire of EU on Western and East. Theological bases of orthodoxy were determined in Byzantium in IX-XI century Orthodoxy is final formed in 1054 after the division of churches. Got distribution mainly in East Europe and on Near east. On Russia orthodoxy is present officially from the end of X in. Basis of dogma of orthodoxy is made by Scripture (Bible) and Sacred Legend. It comes from confession of triune God of creator and manager of Universe, beyond the grave world of posthumous requital, expiatory mission of Jesus Christ, opening possibility for the rescue of humanity which the seal of original sin lies on. The role of mediatrix is taken a church between God and people. A central place in the culture of orthodoxy is occupied by seven christian mysteries. A large value is given holidays and posts. The row of the dogmas (about coming from of sainted spirit not only from God of Father but also from God of Son, about purgatory, about innocent conception and Virgin Maria by Ann) accepted in a catholicism is rejected in orthodoxy, a few the mysteries are differently accomplished. A center of orthodox (including To the Russian federation) is a church of the Holy Trinity-St. Sergius Lavrae, Zagorsk (Sergiev Posad, Moscow region, Russia, CIS). Friary in Sergiev Posad (Moscow reg. ), spiritual center of orthodoxy, submits patriarch, founded in 1340th one of the most reverent saints - prp. St. Sergius of Radonezh, blessing on the exploits of Dmitry Don; in 1744 monasteries got higher status - large monasteries; the known worldwide architectural band of large monastery, including more than 50 objects, was created from XXV on nach. XIX v.; in 1741 the Trinity ("Troickaya" - rus.) seminary was opened in a monastery, and in 1814 there translated the Moscow ecclesiastical academy; after 1917 property of large monastery and academy was nationalized, authorities were organized by museums, restoration of architectural monuments was not halted; in 1946 after Great Patriotic War a monastery was opened, and in 1947 a spiritual academy and seminary was opened in the USSR (CIS); at the beginning of 2000 there were 285 monks and monastic novice (lay brother) in a large monastery (CIS). Roman Catholicism - one of three along with orthodoxy and Protestant is the most widespread direction in christianity, designed as a result of dissidence of christian churches in XI in., having the church organization in Vatican (Europe, Apeniny, surrounded Italy), headed a dad Roman; catholicism. Organization of catholic church differs strict centralization, hierarchical character. A monarchist center is a papacy, by a chapter is Roman Dad a residence of which is in Vatican (EU). Sources of dogma are scripture, I.e. Bible, and Sacred legend, or tradition. Being the variety of christian religion, a catholicism acknowledges its basic dogmas and ceremonies, but less dogmatic and orthodox. Buddhism - one of world religions, based on studies about "four noble truths": suffering, his reason, release from suffering (to nirvana) and way to such liberation, arising up in Ancient India in VI-V century B.C. and getting distribution in China, Japan, Burma, Mongolia and some other orients Asia. On behalf of legendary founder of religion Gautama (Buddha), which it was afterwards begun to name Buddha (buddha - "clarified"). A buddhism is denied by life of God and puts a man in the center of the world (the universe). A rosary is very popular. Nirvana is the state of serene rest as ultimate goal of rescue, which is arrived at the personal efforts of believer, directed on a release from earthly senses, passions, affection and experiencing (in a buddhism and in some other religions). In a buddhism and Jainism: state of higher beatitude, aloofness from all of vital anxieties and aspirations and confluence with a deity. "Nirvana" in buddhistic and Jainist religiously-mythological system - one of basic concepts, match against "sansare", mundane life, stick. To submerge in nirvana - to give oneself up the state of complete rest, beatific slackness. In a tantric buddhism often use a rosary from the bones of yak or cow, mammoth, dog-tooth of walrus and other modern materials. As a rule, a rosary is made out of different breeds of tree or stone. Traditional amount of beads - 108. In a buddhism a rosary is used for the count of amount of the pronounced mantras. Thus every bead of rosary is used twice: in the first time, when practicing pronounces the complete circle of mantras - 108, in the second, when the amount of well-read mantras exceeds 1000, that 10 times for 108. In this case, the special meter moves on a 1 bead forward in relation to a central link beads are "mortars". Often a meter consists of 10 elements which move like a rosary, that facilitates the count of hundreds. For every practice there is the certain recommended number of reiterations of mantras in a buddhism, which is minimum for achievement of experience of spiritual realization of this practice. It is forbidden to use bones of human people. Hinduism rosary-necklace (rudraksha) contain 108 usually, 54 or 50 (on the number of letters of the Indian alphabet) grains. A rosary is the necessary attribute of goddess Sarasvati, Brahma, Shiva, Ganesha et cetera. In hinduism (religion is acknowledged by a buddhism) beads with 108 grains sometimes have delimiters-rod after 36th and 72th beads (or different from other 36 and 72 beads). Vaishnava associate 108 beads beads with 108th main gopi Vrindavan, 109th Head Bead symbolizes God Krishna. Islam, islam, mohammedanism is the youngest modern world religion, arising up in nach. VII in. and in a great deal defining history, ideological and cultural life of considerable part of population of near Asia, Africa and partly Europe in middle ages, New and newest time. One of the most widespread monotheistic religions of the world, arising up in Arabia in VII in., getting distribution on Near and Middle the East, in the countries of Far East, South-east Asia, Africa and having the dogmas worship single God - to Allah and confession of prophet of Muhammad by his envoy. An islam arose up in Arabia in VII in. A founder is consider a prophet Muhammad. An islam and christianity is acknowledged also the state Israel and by judaism (monotheistic national religion of jewries, arising up on territory of Palestine on the border of 2-1 millennium BC). A moslem rosary count 11 usually, 33 and 99 (on the number of the divine names of Allah) and sometimes rod (rod). A traditional moslem rosary consist of eleven marbles, sometimes is a bridge (oval grain, flat group and t. of p.) and further again that sequence to the set amount of marbles (multiple 11) - thirty three etc. Number of 3 x 11 = 33 beads is laudation of god Allah (pronouncing of words "Allah is great" is "Alla khu akbar"). Look like christian and can be used complex in different religions. Moslem prayer. 1. Intention of prayer (element, adopted at christianity and other religions). 2. Being on feet. 3. Pronouncing of words "Allah is great" ("Alla khu akbar"). 4. Genuflection. 5. Falling with one's the face touching the ground. 6. Pronouncing of prayer. 7. Reiteration of the name of God. 8. Pronouncing of formula there "Is not God except for Allah and Muhammad is a prophet of Him" (element, adopted from judaism). 9. Greeting. 10. Pronouncing of the different names of Allah (to 99 names). 11. Continuous reiteration of widely-used popular say parts of prayer choir after imam (singing). Prayer (asking). Laudatory, testimonial or pleading address of priest or layman to God, our Lady or saints. Address to God, to by a saint with a request about sending of blessing and disgust wicked, containing gratitude, laudation. Set phototypograph pronouncing a priest, believer or by persons interested at an address to God, to by a saint. Prayer is necessary part of religious cult, obligatory attribute of ceremonies, divine services or church holidays. It can be private (domestic) and public (temple). The most ancient prayers are fixed in Manuscripts of the Dead sea is the state Israel, nationality is jewries (hebrew), book of "Torus" (the Old Testament of Moses, which every year is read by jewries). Prayers were written also in Latin, greek language and additionally translated from a hebrew, and then translated into the Church Slavonic and modern Russian language. There are variants and on other languages ("I-dzin", China, South-east Asia). Horologion. Book of Hours, Horae, the Primer (brit.). Orthodox church book, containing the texts of canticles and prayers for daily divine worships, urgent by "hours". Church-theological book, containing psalms, prayers, canticles and other texts of "day's" circle of divine service, and also texts often used the book of prayer, euchologion - the horologium, the Horologion, the hour book, the Book of Hours. A horologion is a book, which plugs in itself psalms, prayers, canticles and other texts of day's circle of divine ritual service (except for the texts of liturgy, collected in service ritual book). A horologion targets at church readers and chanters (in Ukraine nonbelievers sing in church choir even), however much he serves as also a book for reading at teaching a language. Is insignificant thin inclusion of black falcon eye is a "eye of salamander"
In bakhai use a rosary with 95 grains for the obligatory daily 95-multiple reiteration of the Great Name. A rosary is also possible with 19 grains on a circle and 5 on a free end for an account 95 as five times on nineteen. In sacral practice of sikhs a rosary is used from 27, 54 or by 108 stone. The followers of Vajrayana (tantric buddhism) use a rosary with a filament, formed from five varicoloured fibres: dark blue, green, white, red and yellow colors, which symbolize five elements, lyings in basis of the visible world (space, air, water, fire and earth). Chinese conception of 5 basic element U-SIN. Or it is a set of stone dark blue, goldish, white, red, yellow flowers. United in a ring a rosary is often complemented some special element (brush, rods etc.). In some buddhistic rosary one is selected more large and, unlike other, gold pearl is a sign of Buddha. In traditions of Krishna worshipa one bead has a brush, symbolizing Krishna with a peacock feather in hairs. In many traditions on the free ends of rosary abandon a few beads which are used as meters of the told off rosary. A christian rosary have in the composition a cross, medallion and (or) brush. Old Believers' lestovka has in place of connection of ends of ribbon rod as four edged triengles in which there were seven account movements in old tradition. Depending on a size and length beads and traditions the different ways of their carrying are possible. The special short rosary with the small number of grains or knots (so-called digit or finger rosary) is put on a finger. More long, most popular, put on a wrist. Catholic rosary-rozariy rush about in hands, winded on one of hands, if necessary inserted for a belt (strap) or clean up in a pocket. It is possible to carry a rosary in the specially sewn together sac - "scapula", which can be decorated embroidery, on him the texts of prayers can be written, or saints are represented. Traditional method to carry a long rosary - to put on a neck as a necklace, beads and necklace. Thus a long monastic rosary can go down to earth and below. Man's beads in itself are a reminder about prayer, united in a ring - about continuous prayer. Sorting out of rosary also allows practicing to save attention, contest with the loss of concentration and sleep. In some practices beads from different materials of doctor-litotherapy provide with ability to cure one or another illnesses. In addition, difficult motility of fingers, sorting out a rosary can help at treatment of illnesses and joints of hands. Reflexology, point and muscularly-tendon massage of hands. In Ukraine (CIS) a rosary also love simply as jewelry - any. Traditions of stone - from the historical quarry of "Femoston Open" (Australia). Handling a rosary must be exact, it is desirable not to drop them, stone can crack or broken up beads, stone or torn filament, part of stone can be lost. A rosary is held in a hand (long - in 2-3 turns), wind on a brush or carry like beads on a neck. A rosary could be formed as the special type of the modern decorative and applied art as feature of the masculine handling stone - could take part of stone from beads, bangles or other rosary. It is better not to drop a rosary, not lose and not break up. Masters usually do a rosary under an order, collect them anew and repair. Properly to behave to information about medical and magic properties of minerals? With a carefulness. We do not set to judge, whether stone have some magic and mystic properties (in itself - without the account of traumatism, poison and radiation), whether there is connection of stone with a month, in the day-time and even chasom births of people, whether there is dependence between the color of stone and character of man traits, stone and time of year. We collected the most widespread opinions of stone (including contradictory) and call you to behave to it with a humour and critically, not useing stone as instrument of self-treatment. In Russia, Azerbaijan, Georgia and Kazakhstan (CIS) along with traditional use a flat, so-called "flat flip" rosary - flat segmented metamerized ribbon tape, not united in a ring, collected from the small number of rectangular plates yet and. An usual number of elements is in such rosary - 13, but possible also beads from 8, 10 and by 12 elements and other amount of elements. A flat flip rosary is used as an attribute of "steep" man, they can be related to any religious cult (amount of stone and religious loading). A similar rosary twist, intercepting fingers, round fingers or all of palm, or sort out in hands as an usual rosary. Alike on komboloi. A flat flip rosary initially sorted out in hands, as classic, pronouncing prayers at this time. It is a religious church attribute, as well as other generally accepted rosary. The rare term of "penitentiary" - sinner, repentant, repenting, repented is also used in religion (catholicism and christian religions, accepted in the USA). Repentance of penitent at pronouncing of prayer (rus. "magdalinki" is a repentant sinner Maria Magdalina, Israel, iconography subject of theme of Jesus Christ). Later a flat rosary with the christian and buddhistic "loading" began to revolve and twist, as greek komboloi. This employment was got by wide distribution. Man's beads from bread, crumb and panary crusts ancient buddhist monks ("rusks", to dry "rusks") modeled yet is a famous spanish fairy-tale of "Buratino" (thin long pointed nose), three crusts of bread as material for a throw rosary and tavern "Three Gudgeons". Man's beads from the stone of date is the fairy-tale of "Pinokio", Near east, known no less, where stone are used from dates as material for a rosary (the manufacturers of these flat rosary ate dates). Man's beads from a composite plastic ("plastifikat" - rus.) are not popular traditions of Chile (South America). Gaming-houses, beads is Las Vegas, USA. Man's beads from bread, date stone, composite plastic, gambling belongings, imitations of stair and other similar that and materials it is possible to meet usually in museums, sale they do not enter. Flat rosary - a rare for today kind is beads, on our site a modern uncriminal flat flip rosary is presented in an assortment from a decoratively-carpentry stone. A flat flip rosary from a stone is comfortable and practical, material lasting, them it is possible string, they are inexpensive and became part sew on lives, many use them as by the comfortable and rare modern wares of the decoratively-applied art of XXI century.